The Microsoft Imagine Cup is a global student technology program and competition, providing opportunities to students across all disciplines to create as teams, using their creativity, passion and knowledge of technology. By creating applications, games and solutions that can change the way we live, work and play, teams also compete for a number of prizes. 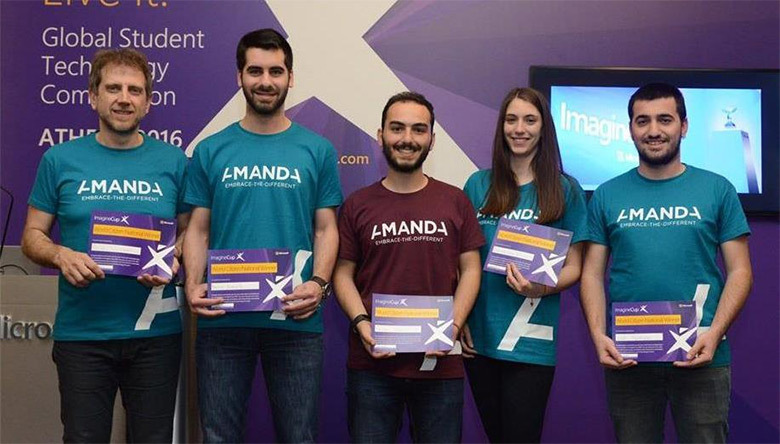 This year, the World Citizenship award and its assorted $50,000 dollar prize, went to Amanda, an anti-bullying app created by a Greek team from Thessaloniki, Greece. A team of students from the Aristotle University of Thessaloniki, Engineering School, Department of Electrical & Computer Engineering, created the app to identify and tackle the wide-spread phenomenon of bullying. AMANDA presents a novel ICT-based approach for bullying detection and intervention in children’s everyday life, by introducing new ways of behavior self-managing tools, set within a collaborative care context with psychology professionals. Specifically, the main aim of AMANDA is to create an ICT-based, gamified behavioral analysis approach for capturing bullying tendencies and to apply ICT-based interventions countering identified risks based on bullying detection, relating to low empathy, self-confidence and awareness. The Amanda Project team consists of Georgios Schinas, Ilias Chrysovergis, Margarita Bintsi, and Vasileios Baltatzis with Leontios Hadjileontiadis acting as the team mentor. Amanda Project – Embrace the different.